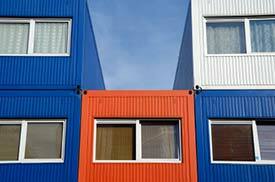 ABOVE: Student housing made from freight containers. This handsomely designed site has expanded into a full-fledged alternative city guide, but it still has plenty of professional-quality photographs (including a few that may shock the Little Old Lady from Dubuque). Michael Fenichel offers half a dozen pictures to accompany his Outsider's Guide to Amsterdam. Photo: Jan van Den Brink.